Looking for our brochure? download the brochure here. No company can build a reputation on what they are going to do, only on what they have already achieved. Whatever we do, we try to do it right. Our vision is to include all our stakeholders in our quest to provide sustainable packaging solutions, while minimising the impact on the environment and the waste of valuable products, and enriching communities in which we operate, to leave a better world for future generations to enjoy. We engage in a partnership with our customers with regards to shared values, standards and responsibilities to ensure the entire chain is compliant with market demands on sustainability. We strive to meet or exceed the end user’s expectations and deliver competitive advantage. In 2016 LC Packaging founded the LC Supports Foundation. The objective of this charitable foundation is to contribute to improving the welfare and environment of countries and local communities in which LC Packaging is active. LC Packaging’s certification includes SA 8000, EcoVadis, ISO 14001 and OHSAS 18001, and we are a proud member of the UN Global Compact. 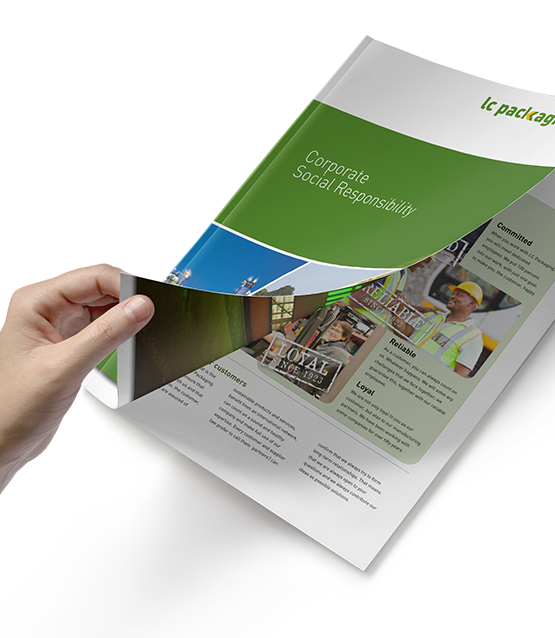 More information on sustainability can be found on our corporate website.